Charles Krauthammer on Friday had a heated debate with the Washington Post's Colby King over what the Tea Party stands for as well as who its leader is. As the panel on PBS's "Inside Washington" discussed Delaware Republican senatorial nominee Christine O'Donnell's surprising victory Tuesday, the conversation naturally gravitated towards the conservative movement reshaping the face of politics. "They [the Tea Party] have a litmus test that goes into being right to life, social conservative issues that they're strong on," said King. 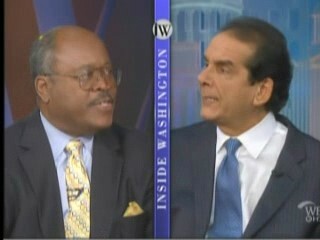 Krauthammer pounced, "Look, I hate to say this, but I think that is completely wrong." COLBY KING, WASHINGTON POST: They [the Tea Party] have a litmus test that goes into being right to life, social conservative issues that they're strong on. No, they would get rid of the IRS if they could. There is no room, there is no room for compromise because compromise is a bad word as far as they're concerned. CHARLES KRAUTHAMMER: Look, I hate to say this, but I think that is completely wrong. The Tea Party has distinguished itself in being almost exclusively about governance, the reach of governance, taxation, economic issues. It is not the social conservatives. In fact, that is what distinguishes it. And I think the other element that is being missed here is it arose spontaneously as a reaction to an extremely aggressive, extremely ambitious left liberal administration that instead of, for example, attacking tax reform - which had it tried that at the beginning of its administration would have had bipartisan agreement and great success, as Reagan in '86 - it decided it wants a reform of health care which nobody at the time thought was the major issue in the time of economic recession. KING: You just can't rewrite the rules. I mean, Sarah Palin didn't even come to the state of Maryland but endorsed the Republican opponent of Governor Ehrlich only on the basis of a checklist. KRAUTHAMMER: Palin is not Tea Party. She is not Tea Party the titular head or at all. KRAUTHAMMER: The Tea Party is a spontaneous, leaderless movement which is economic and not social conservative. KING: I get mail all the time from the Tea Party of Florida for example there, Tea Party spokesman from around the country, they, they exist as a unit. As readers can see, Krauthammer might think the Republican Party would have been better suited if Mike Castle won Tuesday evening, but he still is an outspoken conservative ready to smack down media members when they're wrong. Despite many Tea Party supporters' disappointment over his views on O'Donnell, America would be far better off with more straight-shooting commentators like Krauthammer.